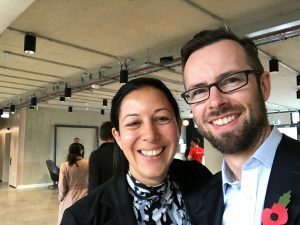 At the close of 2017, I was fortunate enough to represent GBx and join the SVC2UK delegation visiting Cambridge and London to meet some of the hottest startup and scale-up entrepreneurs from across the UK. I came away, impressed by the depth, breadth and future of the startup ecosystem – fueled at the grass roots by entrepreneurs from across the UK and the world, and top down from the highest levels of government. SVC2UK was founded in 2010 by Reid Hoffman (LinkedIn founder and Greylock partner), Sherry Coutu CBE and Ellen Levy with a mission to bring the latest insights on scaling technology businesses from Silicon Valley, direct to the heart of British innovation, in the process, building lasting bridges between entrepreneurs and execs across ‘the pond’. The multi-day programme was a tour-de-force of organization. In quintessential British style, each day seamlessly blended cutting-edge innovation with centuries of history. SVC2UK got rolling at the Cambridge Science Park with panelists covering the most pressing topics of the day; from starting and financing businesses to the importance of diversity in high growth tech companies. After speeches at the Cambridge Union from Matt Glickman, entrepreneur and lecturer at Stanford GSB, Renée La Londe, Founder and CEO of iTalent Digital, Shiza Shahid, Founder of the Malala Fund and SVC2UK’s own Sherry Coutu, the evening closed with drinks and dinner at Trinity College. An eclectic guest list highlighted the depth and breadth of Cambridge’s tech ecosystem, including Eben Upton, CEO of Cambridge-based and world renowned, Raspberry Pi and Professor Andy Neely, Pro-Vice-Chancellor of Cambridge University, who, in a newly created role is responsible for Cambridge’s partnerships with enterprise and business. 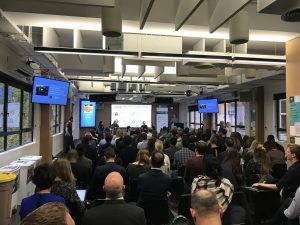 The second day, saw us down to London, to join with UK-based entrepreneurs and investors in panel discussions at Google’s Campus London and the Barclays Rise innovation centre. This time, strategic partnerships, pitching and fintech were the focus with lively discussions between participants from both sides of the Atlantic, including at least one entrepreneur with a foot in both camps; Eamon Jubbawy, co-founder of London-based Onfido who have in the past year, rapidly expanded into Silicon Valley. Notwithstanding the excellent content and discussions of the daytime panels, day two of SVC2UK was only just getting started… moving into the evening we donned suits and ties and equivalent formal wear for the ladies and headed over to St. James Palace for HRH Prince Andrew’s Pitch@Palace event. Being San Francisco-based, I hadn’t seen that many Brits in suits outside of the BABC Christmas Lunch! 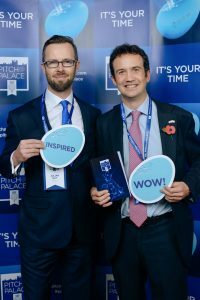 Sartorial differences aside, Pitch@Palace 8.0 viscerally demonstrated the energy of the UK’s startup community, with entrepreneurs working the room like Silicon Valley pro’s, focused on getting introductions to prospective customers and meeting investors to scale their businesses to the next level. The entrepreneurs were well prepared for their ‘TechCrunch Battlefield-style’ pitches, ably MC’d by non-other than European TC Editor, Mike Butcher, himself. The winners, as voted by the audience, were the founders of Eat Me app, two 14 year old girls, exemplifying the future of British entrepreneurship as vibrant, diverse and positioned for growth for many years to come. With each day just getting better, SVC2UK rolled into day 3 with a full head of steam… next stop; Buckingham Palace, 10 Downing Street and Westminster Abbey! Helping entrepreneurs move their businesses forward is what it’s all about, so the CEO Summit was the highlight for me. The experience was amplified and made all the more memorable by HRH Prince Andrew’s Pitch@Palace joining forces with SVC2UK to host the event at Buckingham Palace, what a rare and special treat! With a full morning of round table discussions, founders and CEOs came prepared with their most pressing questions; from hiring, retention and growing teams internationally, to preparing to raise capital and considering if, and when, they should develop a Silicon Valley presence. The roundtable format enabled our groups to pool their collective wisdom from startup operators, investors, corporate partners and lawyers, serving as a microcosm of the startup ecosystem and demonstrating how, experience and energy harnessed together are a powerful force to drive UK innovation forward. The afternoon saw us take a short stroll across St. James Park to 10 Downing Street to meet with Margot James MP (currently Minister of State for the Department for Digital, Culture, Media and Sport). The group joined in an engaging discussion about digital inclusion and how the benefits of technology could be distributed across the whole of the UK. It was inspiring to see the UK Government taking such an active interest in technology at both the policy and practical level and if this momentum can be maintained I’m hopeful that Britain can sustain its leading position in European innovation even as the UK leaves the EU. Rounding out this particularly fantastic day, the SVC2UK delegation finished up with a VIP dinner at Westminster Abbey where Deputy Mayor of London for Business and two-time fintech entrepreneur, Rajesh Agarwal gave a warm welcome. Serial entrepreneurs and leaders from industry shared insights and entrepreneurial war stories long into the night. What a day, what a week! It was an honour to join such an inspiring delegation including Steven Sinofsky, Jess Erickson, Ryan Burke, Shiza Shahid, Patrick Chung, Stephanie Tilenius, Karen Appleton Page, Ellen Levy, Renée La Londe, Matt Glickman, Jacquelline Fuller, Obi Felten and Hillary Mickell. I’d like to give special thanks to Sherry Coutu, Janet Coyle, Karen Sandhu and the whole SVC2UK team for putting on a truly amazing event – and that is no Silicon Valley hyperbole! 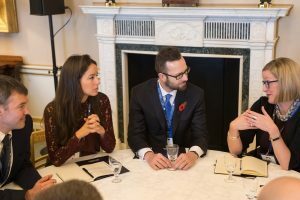 From the forefront of innovation in Cambridge’s research parks, to policy discussions with ministers at Number 10 and my highlight, mentoring CEOs at Buckingham Palace, it’s abundantly clear that British tech entrepreneurs enjoy the full support of their country and I’m excited to see their businesses continue to grow domestically and around the world in the years to come… and if the opportunity presents, to welcome them to Silicon Valley!